LAHORE: (Saturday, September 16, 2017): Punjab University and University of Gambia, Gambia have signed a Memorandum of Understanding to collaborate in various academic disciplines and promote bilateral relations. In this regard, an MoU signing ceremony was held at committee room of Vice Chancellor’s office. PU Vice Chancellor Prof Dr Zafar Moeen Nasir, Gambia’s Vice Minister for Higher Education, Research, Science and Technology Yaya Sireh Jallow, University of Gambia’s Vice Chancellor Prof Dr Faqir Anjum, Deputy Vice Chancellor Prof Dr. Ousman Nyan, deans of various faculties and principals of colleges were also present on the occasion. Dr Zafar Moeen Nasir said that PU would waive off fee and provide free accommodation to University of Gambia’s faculty members who wanted to pursue their higher studies at PU. 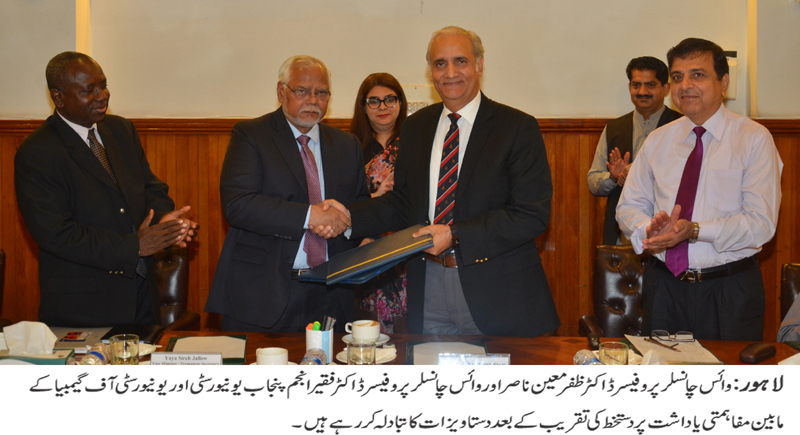 He said that PU would extend every support to enhance academic collaboration between the both universities. The VC also gave a detailed briefing regarding Punjab University on the occasion. Mr Yaya Sireh Jallow said that Pakistanis were playing their role in promotion of higher education sector in Gambia. He thanked PU VC for extending maximum support to University of Gambia. University of Gambia’s VC Dr Faqir Anjum said that the university would like to seek cooperation from PU in the fields of medical, engineering and science. He invited PU faculty members to train University of Gambia’s faculty members and students under four weeks crash programs in different disciplines. Later, PU VC Dr Zafar Moeen Nasir presented souvenirs to the guests.